Biotin (Vitamin B7) is a water soluble, essential B vitamin which is naturally found in bread, liver, pork, salmon, avocado, cheddar cheeses, and egg yolks. It may also be found in certain bacterial colonies in the large and small intestines. Biotin is widely known for its importance in cellular development and its assistance in fatty acid, carbohydrate, glucose and amino acid metabolism. Biotin is also a very important nutrient in hair, skin and nail health. 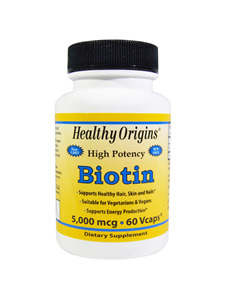 Healthy Origins Biotin is suitable for vegetarians and vegans. As a dietary supplement; take one (1) capsule daily, preferably with a meal or directed by a health care professional. *%Daily Values are based on a 2,000 calorie diet. Vegetable capsule (cellulose, water), rice flour. No sugar, salt, starch, yeast, wheat, gluten, corn, soy, fish, shellfish, nuts, tree nuts, egg, or dairy. No preservatives, artificial colors, or artificial flavors. Q. What is biotin and what does it do? A. Biotin is a water-soluble vitamin that is a member of the b-class family of vitamins. It’s naturally produced by your intestines in very small amounts, but it’s not well documented if these small amounts play any role in immune function. Biotin was once known as Vitamin H.
You can find biotin in a variety of foods. This includes oatmeal, vegetables, peanuts, egg yolks, mushrooms, nuts, rice, spinach, potatoes, poultry, and beef. Q. What are the benefits of taking biotin? A. Biotin and other members of the B-class vitamin family play a vital role in your body’s metabolism of proteins, carbohydrates, and fats. Through this process, biotin plays a key role in the Krebs energy cycle. It could even play a key role in fat loss. In addition to these functions, biotin plays an important part in the growth and maintenance of your bones, nails, and hair. A key sign of biotin deficiency is hair loss and brittle nails. Q. Who can benefit from taking biotin? A. Biotin helps the body convert food into energy. Because of this, many say that biotin increases your level of energy and by improving the digestive process, biotin can also help people lose weight. If you’re looking to gain energy and lose weight, biotin is ideal for you. A. Biotin is an important component of enzymes in the body that break down certain substances like fats, carbohydrates, and others. There isn’t a good laboratory test for detecting biotin deficiency, so this condition is usually identified by its symptoms, which include thinning of the hair (frequently with loss of hair color) and red scaly rash around the eyes, nose, and mouth. Nervous system symptoms include depression, exhaustion, hallucinations, and tingling of the arms and legs. There is some evidence that diabetes could result in biotin deficiency.